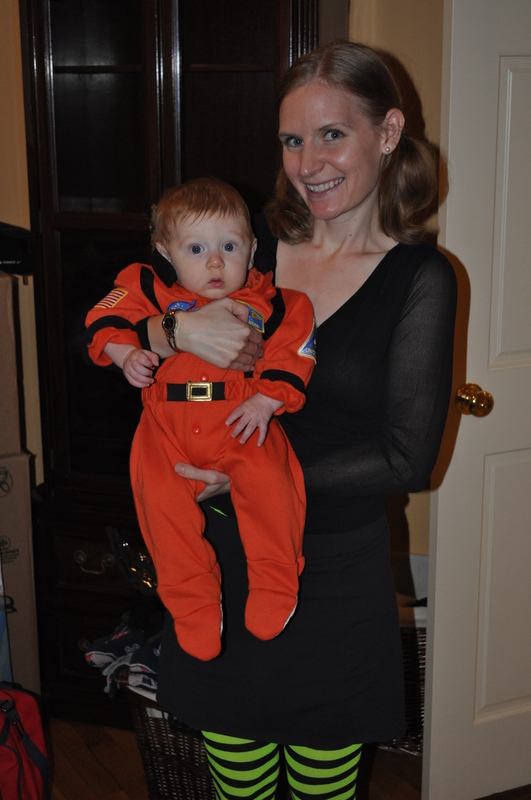 Sarah P. was 29-years-old in 2010 when she gave birth to her son Max. After he was born she did something that no one else at her firm had done since she’d been there: She took maternity leave. Sarah is a trader at a hedge fund in Boston, and a successful woman in a field that is only slightly less male-dominated than Major League Baseball. When she and her husband Marc decided to have a child, she knew she’d be blazing her own trail as she tried to figure out how to balance work and maternity. In the following interview Sarah talks about her early efforts to hide her “baby bump” and her newfound ability to pump milk and answer emails at the same time. 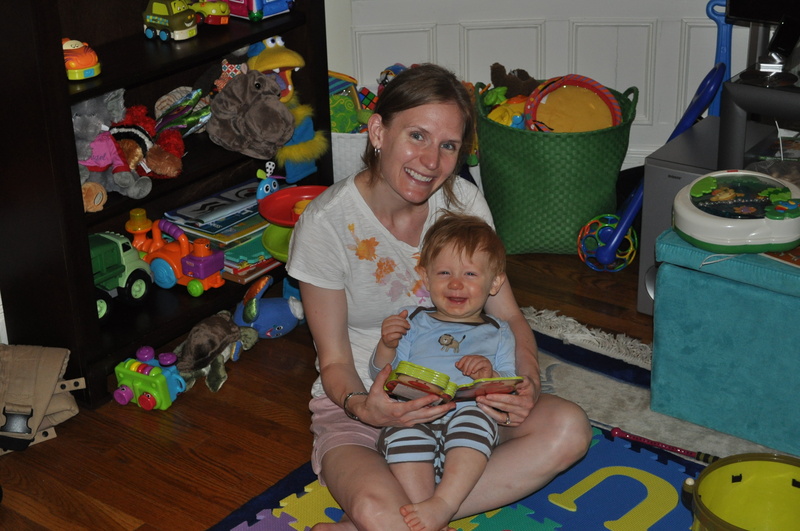 She also discusses her blog, To the Max, shares a few things she learned from her mom about how to raise a child, and reflects on the uncommon busy-ness and unlikely rewards of the last fifteen-months. 1. Tell me a little bit about where you were in life when you had Max—where you were living, what you and Marc were doing, what life felt like at that time. Marc and I had just moved to Brookline when we found out that we were going to be parents. It wasn’t a coincidence. We knew that our one-bedroom condo in downtown Boston wouldn’t work for three. Of the two of us, I was particularly sad to leave the city, and had to remind myself that we really were only a few subway stops away. Our new neighborhood was widely acclaimed to be an excellent choice for kids – plenty of parks, trees, good schools, sidewalks wide enough for strollers, access to public transportation and town centers by foot, and other 30-somethings with young kids. It felt like a lot of change now that we were cooking more and going out less, spending more time commuting, and generally acting less spontaneously. But that was before Max (and the real change) came! 2. You’ve got a job with a lot of responsibility in a field that’s male-dominated. What’s it been like working while pregnant, taking maternity leave, and being a mom in that environment? This was something that made me stronger, for sure. No one in my office had had a baby while I’d been there, so there were no clear signposts to follow. I stressed a lot about when to have a baby, how to avoid “showing” for as long as possible, how to avoid alcohol at company events without being conspicuous about it, and then, figuring how much maternity leave was appropriate, as it was mostly up to me. Would taking twelve weeks seem like I didn’t care about my job? I worried that I might be jeopardizing my long-term trajectory within the firm, as you lose a lot of knowledge by taking any time off. On top of that, there’s the guilt that comes with making others pick up the slack, and then the pressure to catch up on lost time, which is especially hard when you’re a new mom. Maternity leave, as it turns out, isn’t a vacation. I remember someone asking what exactly I did during my leave. I didn’t say breastfeeding every two hours, showering once every three days, and eating like a bird! Motherhood and job stress have gone much better than I had anticipated. Luckily, I have a lot of help, and know that Max is well cared for during the day. His nanny texts me photos of him throughout the day so I don’t miss him (as much). The transition from maternity leave was hardest – I often wondered how many “firsts” I was missing out on. But time wore on, and I got roped into the excitement of the market, and even started to feel like my old self again. Now, I run home at the first opportunity and try to cram as much in as possible in the two hours we have together before bedtime. We definitely make it work. 3. The New York Times parenting blog Motherlode recently ran a discussion about women being “torn” between their careers and their children. Is that something you’ve felt? I never felt torn about whether to have kids. The stickier considerations centered on timing, logistics, and money. I worried that having kids on the early side would stymie any gains I’d made up to this point (and thereby sort of negate all the hours of grunt work that I’d put in). I also worried (again, pre-Max), that I’d get caught up in the “supermom” trap, in which women find themselves adding to their already busy schedules rather than reworking them, and then becoming unhappy in the process. Now that I am a mom the choices are more obvious (and easy). I am fortunate enough to be able to smooth over some of the rough edges by spending and outsourcing, like getting groceries delivered instead of rushing around after work. I’ve pared back my hours at the office and tried to shift what I can to the late evening, after Max has gone to bed. Unfortunately, I turn down all but the most important after-work engagements (also, in part, because Marc travels a lot and I don’t want Max to go from babysitter to babysitter). This is tough, though, because these are good occasions for networking and learning more of the nuances of the business. At the end of the day, I think what matters most in my profession are simply the contributions that I make during market hours. Excelling at work (and bringing home “the bacon”) mean that I have something (else) to look forward to, while providing for Max at the same time. Something I can feel good about. 4. Any funny “pumping” stories from work? Oh vey. Let me start by saying that I work on a trading floor, where even the long bathroom break can raise an eyebrow. So when I came back to work and started pumping four times a day for 20-30 minutes apiece, for the next nine months, it was pretty obvious. The funniest part was probably telling my colleagues what I needed to do. I sent an email to those nearest to me saying that I would need to be off the desk for certain periods of time, and that they could reach me by phone, text, or email, and that I could respond in a timely manner (I didn’t tell them that I had “hands-free” pumping technology – that seemed like too much info). I got a few all-in-good-fun retorts but that was it. It was surprisingly easy. 5. Recently you undertook a “Happiness Project” which has included, among other things, a blog about raising Max. Tell us about that. My blog makes me so happy – I only wish I had more time for it. I started it because I wanted to find a way to share some of the funny and poignant Max moments with our broader base of family and friends. I also wanted to document as much of his early years as possible. I’d lost a lot of my own childhood keepsakes in a fire that burned down our house when I was younger – yet another reason to love the age of the Internet. As silly as it seems, I also wanted a project, something new and exciting, and a departure from my own first-year-parent inertia. My only qualms were in opening myself up to the world, committing to posting when I have very little time, and finding the right voice. Up to this point it has been somewhat small in scale – no earth-shattering insights or unique advice, but it doesn’t have to be perfect from Day One. I think motherhood is also a project (albeit on a much grander scale), and because so many parents must be experiencing some of the same things I am, it seems fitting to try to connect, to laugh about the failures, and take pride in the successes. 6. When you think about your parenting style, are there ways in which you try deliberately to parent the way your mom raised you? Or ways in which you try deliberately to parent differently from her? It’s a good question, and although Marc and I have had various discussions about structure, discipline, and parenting, I don’t have a ready answer. Parenting Max, especially at this juncture, seems more like putting out one small fire after another. Take care of basic necessities – keep him clean, fed, and clothed, then try to have fun, sing and be silly, and minimize risk. When I think about my mom’s parenting style I picture how life existed in my teens, but it also applies to much earlier in my childhood. She treated me (and my brothers, but to different degrees) like a friend, almost a confidante, and gave me a lot of independence (and responsibility). It was clear that she trusted me, and if I had wanted to test that I would have to risk disappointing her. It “worked” differently for me and each of my three brothers. I think I will always try to incorporate her happy-go-lucky, feelings first, discipline later (or never) style. But you can also show love by pushing your kids, and some kids may need this more than others. I guess I’ll have to see what Max needs, in part. I’m keeping an open mind. 7. How has motherhood compared with the way you imagined it going in? I certainly didn’t expect it to be this time-consuming and exhausting. I’m not sure what I was thinking! I don’t think I realized that in order to go to yoga class I’d be giving up my only hour to see Max. Or that if I scheduled consecutive after-work events, I could literally go days without seeing him. Or that the girl who loved to shop (every weekend!) would give it up in favor of trips to the park and library. I also didn’t imagine how my life with Marc would change – how we’d rarely be able to eat dinner at the same time, or that we’d be forever “switching off” in order to give the other one some free time. This seems like it would amount to a lot of negatives, but that’s not the case at all. I’ve never been so fulfilled, so happy being mindless and busy, nor so gratified to get a hug, a kiss, a smile, or a peek-a-boo. It’s easy to quantify the number of hours sleep that you’re missing out on and the number of times (in a day) that you put the toys away – it’s harder to explain why none of that matters. I continue to be surprised. This entry was posted in The Parent Interview and tagged breast pump, maternity leave, pumping at work, wall street by Kevin Hartnett. Bookmark the permalink. Sarah rocks it out of the park! Max is a lucky baby!